We’ve all experienced the joy of watching puppies play. These little furballs tumble and toss one another around like it’s their job. When they’re small, it doesn’t look as if these tiny somersaults have much of an effect on their bodies. As they get bigger, however, these tiny tumbles turn into much larger falls with an even greater impact on their developing bodies. Let’s take a moment and think about how imperative proper development is to all growing animals. The most important time in any animal’s life, both emotionally and physically, is the first eighteen months. During this time they begin to develop both personality and their adult structure. 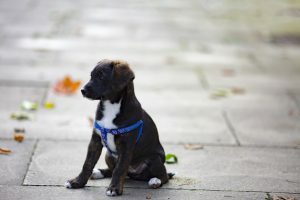 All of those bumps and bruises they experience during puppyhood can become engrained in their adult structure if not addressed in a timely manner. As the saying goes, “as the limb grows, so grows the tree”. Keep this in mind when visualizing your animal’s structure. If they go through the beginning of life in an abnormal manner, it stands to reason that their structure will develop around this, and abnormal will become their “normal”. Imagine for a moment, your puppy is playing with another dog in the backyard. You watch as they run at lightning speed chasing one another. As one catches up to the other, he makes a jump and they both go down twisting a turning. You hold your breath praying neither is hurt. Moments later they’re both up and running again, as if nothing had happened. That means everything is okay right? Well let’s change perspectives for a second. If your toddler fell down a flight of stairs, would you be concerned even if they got right back up and continued tottering? Probably. In fact you’d likely be on the phone with your pediatrician very quickly to see if further action needed to be taken. Why wouldn’t we be just as concerned with our puppy? It is probably because they rarely show weakness. Animals live their lives as part of a pack. They each have a rank within the pack, and being lowest on the totem pole makes one susceptible to constant challenges and possibly death. Though we would never dream of kicking our pet out, they cannot differentiate between a pack with you as an alpha and a pack with another dog as an alpha. Weakness is their ticket out, and for this reason they will do everything in their power to avoid showing any. When your puppy plays hard, he is bound to hurt himself and alter his normal structure. More often than not, that normal structure changes as compensation for injury, rarely is it due to the injury itself. When animals are young their bodies have the ability to mold more easily than at an older age. With that in mind it makes it even more important to make sure their nervous system and skeletal system is stable at this time. Developing with an incorrect structure can have some serious long-term complications. Animals with improper structure are more likely to experience weakened joints which in turn lead to weakened ligaments and musculature, weakened soft tissue can lead to soft tissue injury. The list goes on. What can you do to make sure your puppy develops properly? For one, chiropractic is imperative. Animal chiropractors make sure your animal is in proper alignment and has within normal joint mobility. Doing this allows for your puppy experience puppyhood without quite the risk it might normally have, rather than living in a bubble during the developmental months. Chiropractic adjustments are gentle, low force, and very effective on maintaining a stable structure. If you have further questions regarding your puppy and how to provide a solid environment for growth, feel free to contact us at advancedanimalchiropractic@gmail.com or at 248 602 0807. Why Can't Fido Have Chocolate?